Fabio Danti – the name which reminds us an Italian champion of the driving wheel who was double Champion of Europe and Champion of Italy as well in sporting cars. He died as a young man on 3.6.2000 during training for Italian Championship in Caprino-Spiazzi. He crashed into safeguarding barrier in one of the last curve in high speed and he died at 17:10. Fabio started his racer path on Renault R5GT Turbo in hillclimb racing and in rallye. He obtained the second position in group N in national hillclimb championship in 1991. He tried his luck in go-karts as well in 1992 but he managed to obtain the second position among prototypes in the next season with Lucchini Alfa Romeo. Several absolute wins, especially in the middle of the second season 1994, gave him winning of Italian Championship of sport cars. 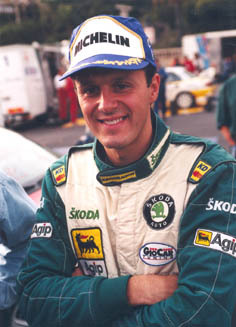 He tried the European Hillclimb Championship in 1995 and when he didn’t know bitter of beating, he obtained the title of European Champion. He overcame a few of records of the tracks. When he started at Czech Ecce Homo in 1996, he confirmed his winning European line with the same result. Fabio Danti changed open spiders for Czech cars with regard to his working activities with Czech company Skoda in Italy. He went from one winning to others on Italian supersalitas in his group. He changed Skoda Octavia, Felicie Kit-Car or Octavia Turbo and Octavia Wagon. He was unconquerable with all of these cars. He appeared on prototype again in season 1998 (in St. Ursanne in Switzerland) and he knocked down Pasqual Irlando who was his successor at European seat. Fabio started with prototype as well in 1999 and he won in a free race Maranello with borrowed car from Italian Franco Cinelli.